"Whoa. Big door. Vic, I'm sending you over the image..."
"Got it, Barry. I've run it over a thousand times already. But it keeps coming up unknown..."
Long-time DC fans will immediately recognise it as the base of the Challengers Of The Unknown, who these days work for... ah, well that would be telling. 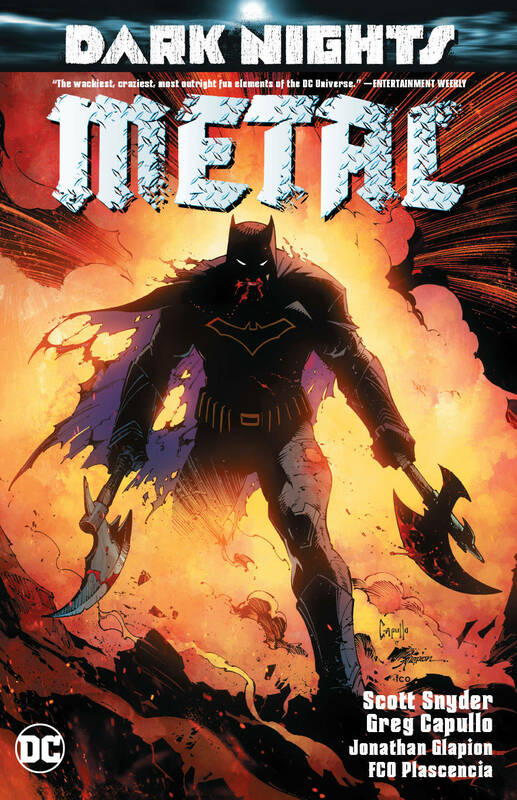 I enjoyed how Snyder weaved in all sorts of DC history into this tale right from the off, be it references to individual bat-books such as BATMAN: THE RETURN OF BRUCE WAYNE written by Grant Morrison, or lesser-used third-string characters like the C.O.T.U. 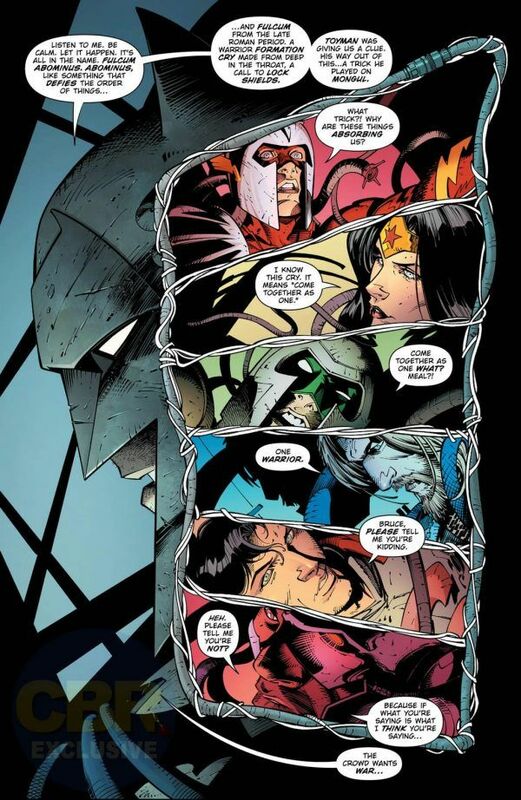 It is a bit weird having to remember in this current version of the DC Universe that the Justice League has no idea who the Challengers are yet (Batman aside, obviously, being his usual know-it-all self). I think there was also a very odd, brief-lived, New 52 incarnation involving reality TV 'stars' as the Challengers if the memory serves. So... following on from events in the Dark Days: The Forge and Dark Days: The Casting one-shots, now collected with a host of relevant reprinted New 52 issues in DARK DAYS: THE ROAD TO METAL, something not so fun and cuddy from... elsewhere... is on the way, apparently being drawn to this reality in some strange way by Bruce Wayne, who could actually do with a good cuddle, so that's a shame. 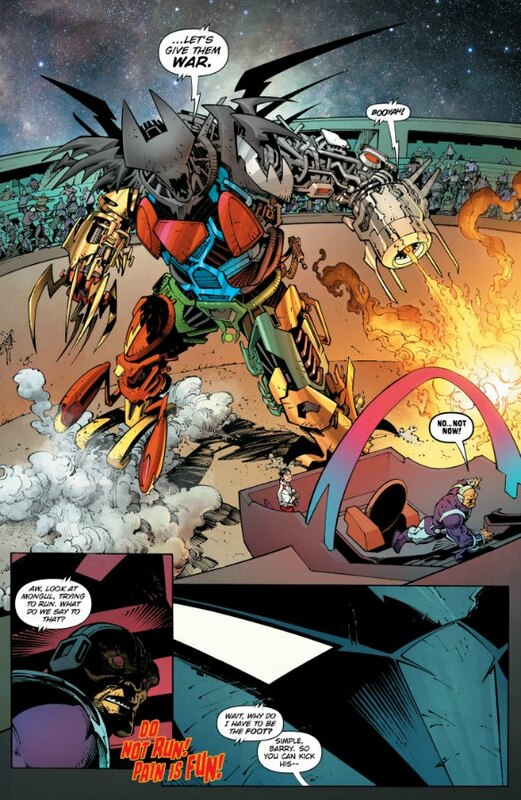 There's a nifty and amusing explanation involving a certain poster of the New 52 Multiverse (also thrown in DARK DAYS: THE ROAD TO METAL as back matter) that probably graced more than a few comic shop walls a few years back which sheds an absence of light on the situation, and that's probably all I should really say by way of plot explanation at the moment. I was, and still am, perplexed by the prologue battle that will titillate fans of enormous, transforming Japanese robots... I'm still oblivious as to precisely what wider purpose that served. 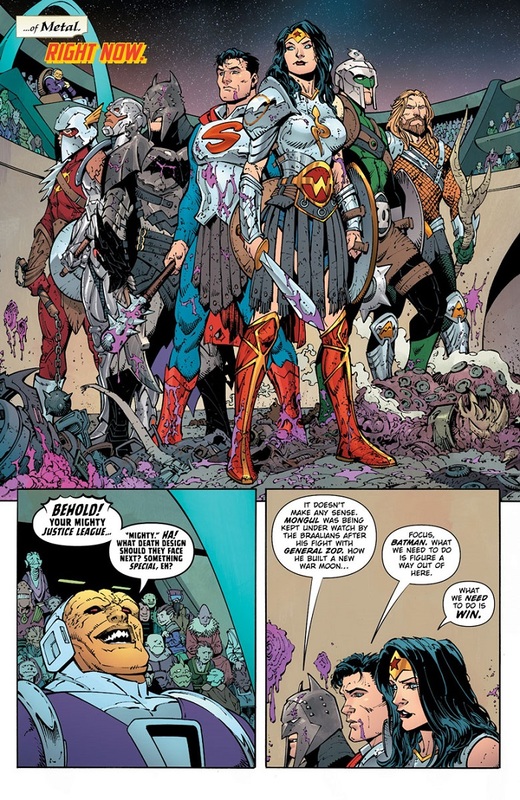 I commented in my review of the first issue that this event had the potential to get completely preposterous, but hopefully Snyder could keep it on track. He did, just about, but only just. There are a few conceits in there that test the old suspense of disbelief, it must be said. It's certainly big, convoluted, bombastic fun, though, and truly an infinite number of times better than the crisis of writing that was CONVERGENCE. I think I can safely rank this up there with CRISIS ON INFINITE EARTHS and FINAL CRISIS in pure madcap superhero event enjoyment terms.